There’s a reason why public transportation exists: so that people don’t have to use cars. Downtown Brooklyn residents have long accepted this reality of urban living and it appears that the Department of City Planning has too. At Monday’s City Planning Commission meeting, DCP unveiled their latest proposal: a plan to reform Downtown Brooklyn’s off-street parking requirements. The oh-so-creatively titled Downtown Brooklyn Off-Street Parking plan would reduce the current zoning requirements for parking in new developments from availability for 40 percent of residential units to 20 percent. As it turns out, Brooklynites aren’t really using parking garages. Either they don’t have cars or they prefer to duke it out on the streets. According to a study sponsored by the Downtown Brooklyn Partnership, parking garages built in new residential buildings—the same ones that developers were required by the city to build due to zoning laws—are only half full in the evenings and on weekends. And, only some 20 percent of Downtown Brooklyn households own cars, according to the Census—a paltry amount given that 43 percent of residents in Brooklyn and 45 percent of residents in New York City have cars. Add to that the fact that Downtown Brooklyn has a slew of public transportation options—it’s served by seven subway stops, 13 subway lines, commuter rail, and numerous buses—and you’d be hard-pressed not to be in favor of the proposal. And, considering that the cost of property in Brooklyn is on the rise, housing that’s affordable, or at least more affordable, is welcome indeed. 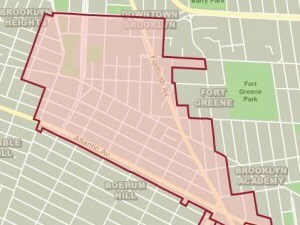 The plans for the proposal are still hazy—it is only in the first stage of the public review process expected to last until August—but DCP said that the new requirements would only apply to high-density commercial districts throughout the Special Downtown Brooklyn District, which runs from Tillary Street to Atlantic Avenue, and from Clinton Street in Brooklyn Heights to Ashland Place. The off-Street parking proposal has some lofty goals. As city planning writes in a release, it’s seeks to “better balance community needs for parking, the cost of constructing new housing, maintaining mobility and ensuring an environmentally sustainable future for the city.” That may be ambitious, but they all sound pretty good to us, so here’s hoping it passes.